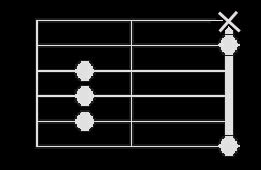 A chord "tone" includes the effect of the "free strings". The free strings are also called the "open strings", and it means the "unpressed" strings -- the strings not pressed by any finger. In previous post, we talked about "move up" or "move down". Remember this: if you move up, move up everything, and if you move down, move down everything. To make this point clearer, take a look again at A-chord. As you can see, only 3 strings are marked to be fingered. By now, You should have figured out how to press the 3 original note on the fretboard. Except the 2 "new" notes on the right, did you noticed them? Don't worry, you don't really need to press them. You cannot press at or before the nut. 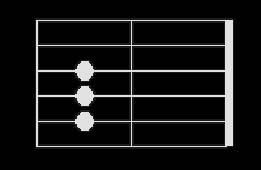 The notes are shown to mean "they are included in the A-chord". These are "open strings". The "X" means you should not use the string. Let's try an example. Let's get a B from A. Remember that if I move A 2 steps up, I'll get a B? If you've been paying real attention, I bet you're now bewildered how the hell you're going to fret 5 notes when you only have 4 fretting fingers...yes, only 4 fretting fingers as the thumb may not be usable. Some actually use the thumb to fret on the uppermost string, but as you see, the string is X'ed. Useless. You are supposed to have enough fingers to fret B-chord now. You may have noticed now why I included the X'ed string-- as you "bar" across the fretboard with your index finger, chances are you're pressing the fat-E also. Remember: don't use it. These kind of chords, re: chords requiring your index finger to cross the fretboard and simultaneously press notes, are called "barre chords". The beauty of barre chords is that just by moving up or down the fretboard, you'll figure out other chords. That was it. If you move up, move all notes up. If you move down, move all notes down. Finally, shown here is how to do the B-chord. Check back the A-chord and note the common 3-notes grouped together, except that the finger assignments were changed because index finger is used to bar across the fretboard.